Last year it was a jubilee of my BlockNote editor – it is 10 years old now. Quite a serious age for software product I think. BlockNote, in particular its HTML WYSIWYG editing engine, was the very first version of H-SMILE core that works now inside the Sciter. H-SMILE core was used in other software products, for example in EverNote. In fact I was one of four developers who implemented excellent idea of Stepan Pachikov (EverNote idea-monger and founder) and created first public versions of EverNote. In parallel and after that I was designing various UIs and editing components. WordProcessor engine that I’ve created for Top Producer Systems (The move.com company). That WordProcessor still works in their flagship product AFAIK. Current stack of Web technologies still does not provide facilities for page oriented WYSIWYG editing so there is nothing to replace WordProcessor yet. I’ve got quite interesting experience implementing text layout and editing algorithms there. Ideas from there have found their way in Sciter code in one way or another. At some point I’ve got an impression that C++ is not the best language for UI programming. In particular GC as a memory management mechanism is significantly better suitable for typical UI tasks – many small objects with quite non-trivial ownership graphs. I’ve started looking on Java but having dependency on installed Java VM didn’t look right at the moment. 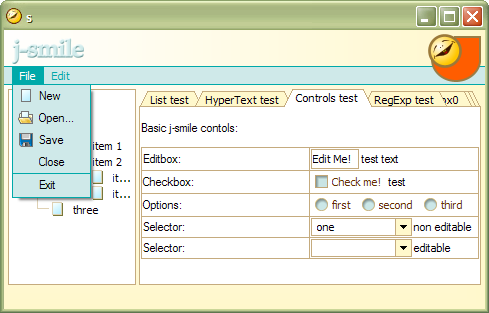 So I’ve created so called j-SMILE JavaVM (based on SuperWaba) that was tailored specifically for UI purposes – designed to be combined into executable of the applications together with bytecodes it is running. J-SMILE demo (buggy but works somehow) and sources of class files are available here. In J-SMILE I started experimenting with HTML as a UI layout manager and sinking/bubbling event propagation mechanism used in Web browsers. These mechanisms were proven to be highly useful for desktop UI purposes too. Pretty much at the same time with my J-SMILE development Sun-Microsoft “Java Wars” had begun. And this immediately put the end to my J-SMILE development. I realized that I have no chances on this front and started looking for other options. Some time later D-language raised in the sky and gave me real hope for the best ever language-behind-UI. GCable, natively compileable so fast and with pretty sufficient functional features. So I’ve started porting J-SMILE to it under the name Harmonia framework. For those who are interested to see Harmonia in action: Harmonia demo, Harmonia sources and class tree. It was time when D-language was changing very frequently. Pretty much each nightly build was changing core grammar. So Harmonia development was similar to shooting a moving target. Far from being normal development process. Having each and every object manageable (garbage collectible) is far from being optimal. HTML DOM tree is a large set of small objects. All these small objects are flooding manageable heap making GC cycles very CPU intense. That’s not about Harmonia only by the way – I believe Android suffers from this problem too when its UI freezes noticeably. I’ve got very strong feeling that each part of UI framework shall use its own memory management and ownership principles that are optimal for the role they are playing. HTML DOM tree has very regular structure with clear one parent – many children ownership graph. Life cycle of DOM elements (read “UI elements”) is also quite deterministic. There is absolutely no need for GC if to speak about HTML/CSS. But code-behind-UI – code that does UI automation in “on-click-here-push-item-there-and-collapse-panel-over-there” fashion has to be manageable. GC there is the must – ownership graph is unknown upfront and frequently contains loops. Ruby and Python – were rejected almost immediately. HTML friendly language shall have syntax that is not dependent on tabs, line feeds, etc. For quite many reasons. And yet Python was using C/C++ heap for object allocations, UI objects lifecycle require compacting GC – objects created and destroyed frequently. Lua – pretty much for the same syntax reasons. But it was a good candidate. I even started creating JS syntax alike compiling front-end for its VM. But discovered in process that Lua’s object/class model is too rudimentary I would say. HTMLayout combined with TIScript became Sciter as you see it now. Oh, and in parallel with all this I was working as UI Architect and team lead at Top Producer Systems (move.com company) on various desktop UI, Web and mobile applications projects. And yet participated in HTML5 and CSS3 specification development as invited expert in W3C HTML Working Group.